I’m a die-hard fan of the extended seminar experience — you know, seminars where students spend 5-6 hours a day for 4-7 days immersed in the art of Middle Eastern dance. Demand for these work-oriented dance experiences has proliferated in popularity in past years, but the “evergreens” of the business continue in popularity due to a commitment to quality and consistency. The Western US has festivals such as “Rakassah” and “Shake’n’Bake”. The Midwest offers the popular “Oasis Dance Camp” with its recent Southern and Northwestern branches. 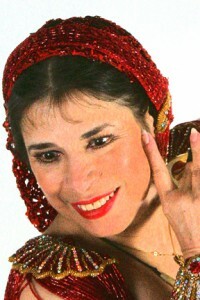 On the East coast, among many notable dance entrepreneurs, Morocco has offered her successful week-long master classes in Manhattan, NY, for the past 14 years. Morocco’s bi-annual seminar in August and January is an intense learning experience for dance students at all levels of development. Under Morocco’s instruction, students work hard developing and perfecting technique, receive important classes in culture and acquire useful choreographies. A well-integrated instructor, Morocco employs the “holistic” approach to Middle-Eastern dance, paying scrupulous attention to training both the body and the mind of the dancer. Morocco’s “Week-Long” starts with “Show and Tell”. 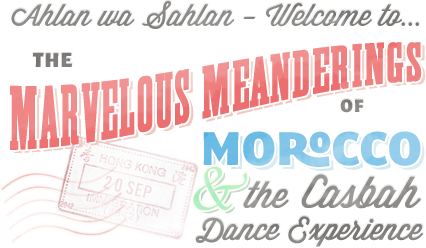 An entertaining show featuring the seminars material in a performance context is presented by Morocco, her teaching staff and the Casbah Dance Experience, Morocco’s dance company. The August 97 seminar concert featured The Casbah Dance Experience presenting the “Guedra” ceremony, an ensemble “Schikhatt” dance, and a “Saudi Arabian” women’s dance we would learn, along with select other dances from their repertoire. Morocco drew upon her own ethnic roots with a gutsy and captivating rendition of a “Sulu Kule-style” Gypsy Karsilama. Popular Tarik abdel-Malik delivered a strong Orientale performance, and guest instructor Gamila el-Masri charmed the audience with a delightful “Melaya Lif” choreography. Students in the audience realized what work was cut out for us starting the next morning despite the evening concerts flash and glamor! The first day of classes is a student “tune-up”. Each morning Tarik abdel-Malik led lengthy warm-ups, conditioning muscles and ligaments for the day’s work. The comprehensive, thorough warm-up routine (very carefully designed by Morocco) is worth the cost of the seminar alone, but the value of the “Week-Long” doesn’t end with conditioning. Morocco takes control of the class after the completion of the warm-ups and the technical portion of the seminar commences in earnest. 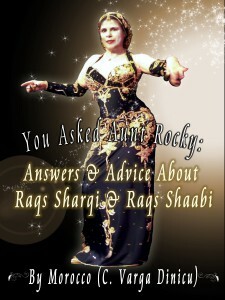 Morocco presents at least two background courses and three choreographies, Tarik teaches a choreography, and the guest instructor presents dance technique or a specialty dance. Morocco conducted insightful cultural lectures pertinent to the Moroccan “Schikhatt” and “Guedra”, “Saudi” and “Sulu Kule”, the ethnic Gypsy-style karsilama, prior to presenting the choreographies for those dances. She also treated us to a very usable Orientale choreography to “Basboussa”. Tarik abdel Maliks charming, lively dance composition, performed to Amru Diab’s “Hatli Elbak”, was also suitable for either stage or classroom. Guest instructor Gamila el Masri’s appealing “Melaya Lif” choreography to “Edellah ala Kefak” was a sassy and clever addition to the seminar’s robust content. Despite a full class schedule, time was scheduled to review and perform the percussion drills necessary for perfecting the play of finger cymbals. Moroccos classes are always an outstanding value for the dancers dollar. Moroccos seminar brims with valuable material for class and performance, the instructors are tireless and generous with their knowledge, and the classes are performed professionally. This years seminar was extraordinary in content and accomplishment. Another incentive to attend Morocco’s Weeklong are the friendly participants: the students are an enthusiastic blend of cultural diversity at its best! Morocco unites a cross-section of nationalities, races, religions and skills through an unsurpassed dedication to Middle Eastern dance. Although the summer seminar is usually at capacity, traditionally everyone works together to give each other an opportunity for practice space and visibility. This is one of the most egalitarian master-classes any dance student will attend. The only competition a student encounters at Moroccos studio is from their own individual goals. The rare team spirit generates from the attention Morocco and her staff give to each participant. No one is ignored and individual needs are addressed — all questions are answered honestly, graciously, and without redress. Morocco and her staff consider every student a “star”, shining in their own special spotlight. Even though Morocco’s “Week-Long” is work-oriented, she is sensitive to the “tourist” lurking within seminar participants. The classes begin early: at 9:30 am. However, since the day starts early, students are excused early too, between 3-4:00 pm. I’m an “adopted” New Yorker, and every time I go back to the Big Apple it’s like returning to a personal Disneyland! If you can’t see it, eat it, drink it or buy it in New York, you aren’t in Manhattan. Seminar participants can explore nearby Greenwich Village, knosh their way to cultural diversity in zillions of ethnic restaurants; see the sites; go to shows and shop to bankruptcy. For instance, our group enjoyed watching other dancers work. We saw the production “Tap Dogs”, featuring hunky, tap dancing guys who were anything BUT “Woofers”! We visited the Cafe Mogador for Moroccan food and a show. If the name “Mogador” rings a bell, its because the house band recently released the CD “Bellydancing for Fame and Fortune”. Even though the CD is great, the Mogador band is even better in person. The entertaining Shamira enhanced their wonderful music with beautiful and inspiring Orientale dance performance. We also enjoyed a night out at the Santorini Restaurant (near the NYU campus). The Santorini is a groovy Greek taverna transplanted to Manhattan. The restaurant has great food, an energetic family clientele, and excellent “kef” music by the Avram Pengas Group (formerly of the Feenjon ensemble). Dance artist Ayshe performed the evening we visited the establishment. Of course, Morocco’s seminar wouldn’t be complete if we didn’t dance in a New York club. The location for this years class performance was the Lafayette Grill in Soho. The Lafayette Grill is an enchanting restaurant specializing in delicious, innovative Mediterranean-themed cuisine. The Lafayette Grill would have won our class approval even if they hadn’t let us dance around their dining room. Speaking of our performances, permit me to modestly express that our classes collective dance talent equaled – or perhaps surpassed, our elegant surroundings! Morocco and Tarik abdel Malik performed excellent solos and concluded our student gala with a knock-out duet. The atmosphere at the Lafayette Grill was excellent, with a lovely dining room, great food, reasonable prices and exceptional service. I hope Morocco continues a winning relationship with this restaurant for future seminars. Also special to our student evening was the opportunity to share our love of Middle Eastern dance with a different audience venue. In spite of aching feet, stiff muscles and “theatrical anxiety”, it is always thrilling to perform and make use of the knowledge we often sweat to obtain. There are wonderful extended study opportunities available to Middle Eastern dancers that are taught by excellent and reputable instructors. I’ve participated in some and plan to attend others, but my favorite is Morocco’s weeklong seminar. Value, quality, location and the infectious enthusiasm of the class are the reasons I enjoy this experience and recommend it to other dancers.